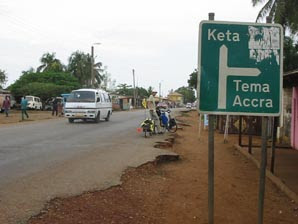 The Interior Minister, Mr Kwamena Bartels has by Executive Instrument immediately imposed a dusk to dawn curfew on Anloga and Keta to ensure peace, law and order in the area. The 0600 to 1800 hours curfew has been imposed following the explosion of violence in the Anlo Traditional Area over the nomination, confinement and installation of an Awoamefia, resulting in the death of six people, including a policeman. "The police and the military will strictly enforce this curfew and anyone, who breaks the curfew, will face the full rigours of the law," Mr Bartels said this at an emergency press conference in Accra on Friday.Mr Bartels noted that in the wake of the violence, the Government, by Executive Instrument had decided to invoke the authority of the Public Order Law 491 to stop any further processes leading to the installation of an Awomefia for the people of Anlo.He said a team of investigators from Ho and the CID Headquarters in Accra were investigating the deaths and had so far arrested 92 people who were being screened to identify the culprits.He said the issue of who was the rightful heir to the Anlo Paramount Stool should be settled through the constitutionally recognized structures of the Regional or National Houses of Chiefs, or the courts and not on the streets of Anlo or Keta or in the media.Mr Bartels said by Executive Instrument, the Minister of Interior had with immediate effect, prohibited all persons in the Anloga and Keta areas from carrying arms or ammunitions.He said though the Government stood by its position of non-interference in chieftaincy affairs it had an over-riding responsibility to ensure peace, tranquillity, law and order. The Minister appealed to traditional and opinion leaders and to all citizens, residents and well-wishers of the Anlo Traditional Area to assist the Government to ensure that calm prevailed.Mrs Oboshie Sai Cofie, Minister of Information and National Orientation, called on the elders of Anlo and Keta to advise the youth and encourage them to use constitutional means to address their problems.Meanwhile, the Fast Track Division of the High Court in Accra on Friday stopped the installation of Francis Nyonyo Agboada, Regent Torgbui Sri III, as the death toll in the riots at Anloga in a protracted chieftaincy dispute rose to six.The court, granting an order for interim injunction, barred the kingmakers, the Anlo Traditional Council and any other persons or institutions involved in the preparation and installation of the Awoamefia of Anlo forthwith "from holding any event to install the person named Fracis Nyonyo Agboada, also known as Regent Torgbui Sri III, as the Awoamefia scheduled for Saturday 3rd November 2007". The court presided over by Justice Marful Sau, an Appeal Court judge sitting as an additional High Court Judge, restrained the same parties from holding any meeting or event concerning or connected to the installation of Regent Torgbui Sri until further notice.The Court further directed that the service of the order be effected by substitution through the electronic and print media. The Inspector-General of Police, Mr Patrick Acheampong, who instituted the action, was represented by Mr Joe Ghartey, Minister of Justice and the Attorney-General and the Director of Public Prosecutions, Ms Gertrude Aikins.Mr Ghartey, in an Ex-Parte motion with supporting affidavit, prayed the Court to restrain the installation of the regent.He said the Anlo Traditional Council gave notice to the police about the installation and it was granted but violence broke out resulting in the death of four persons including a police officer. Mr Ghartey said two more people had been reported dead on Friday and that tension was still high adding that more confusion and bloodshed would happen if the event went ahead.He said unless the parties were restrained by the Court, the installation would go on.Mr Ghartey said the Government had the responsibility of restoring law and order by way of seeking the court order. He said although the IGP withdrew the permit, some people still wanted to go ahead with the installation. "If the court should wait after 48 hours, it would be too late. The court should, therefore, grant an instant order since the nature of the case is volatile.He, therefore, prayed for a restraining order through a substituted service which should be published in the print and electronic media. Earlier on Friday, the Police Administration on Friday confirmed the murder of General Constable Moses Daba of the Volta Regional Police Task Force, who was kidnapped while on duty to maintain order in the chieftaincy conflict at Anloga on Thursday.A statement issued by the Police Administration said Crime Scene Management Teams and Detectives from the CID Headquarters had been dispatched to the scene to assist the Volta Regional Police in the investigations into the killing of the Police Constable and the others. The riots started when a faction in the raging chieftaincy dispute tried to prevent the performance of rites at a shrine to pave the way for the installation of Regent Torgbui Sri III as Awoamefia of the Anglo Traditional area.Eyewitnesses said the police clashed with the crowd that tried to stop the performance of the rites at the shrine resulting in three people being killed and several others sustaining injuries. The statement said furthermore, a joint team of police and military personnel had been deployed in Angola to restore order. Police said 94 people had been arrested and screened and 74 of them had been sent to Ho for further investigations. "The police are, therefore, appealing to the factions in the conflict to exercise restraint and use all legitimate means to resolve their differences. "Furthermore, we also appeal to the residents of the area to volunteer information that might lead to the arrest of those who murdered the Constable and the three civilians." Civilians confirmed dead on Friday are Israel Ahagzi, 28, Mana Senyo, 48, and Menco Tugba, 47.